Outake from an advertisement for the Bertoia Diamond Chair. Photograph by Herbert Matter. Image from the Knoll Archive. 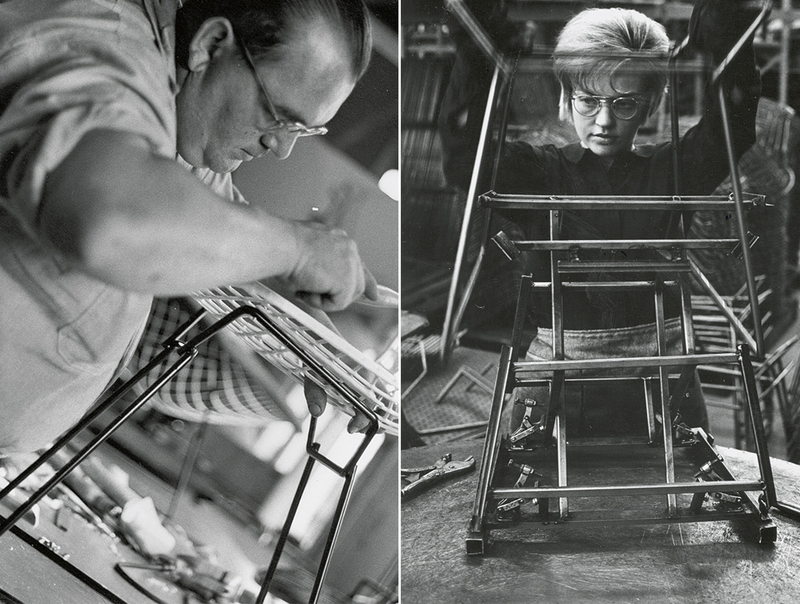 To appreciate Bertoia's talents, one must foster an understanding of the process behind a chair's production. Bertoia's approach was not to ruminate on form in a vacuum, nor generate solutions to perceived problems. As Bertoia discovered, he "was not the man to do research." He explained, "my feeling had to come from an inward direction." Shape, line, and contour, then, were born from Bertoia's handling of a material, whether steel, aluminum or beryllium. "When you really have something in front of you that can really physically be held, it becomes quite easier to make adjustments." Over half a century since the collection was first created, the Bertoia Collection is still manufactured using the same processes developed by Bertoia and Knoll associates in the 1950s. In drawing on photographs from the Knoll Archive and contemporary shots from our plant in East Greenville, Pennsylvania, we've put together a past-and-present picture of the production process behind one of our most perennial products. 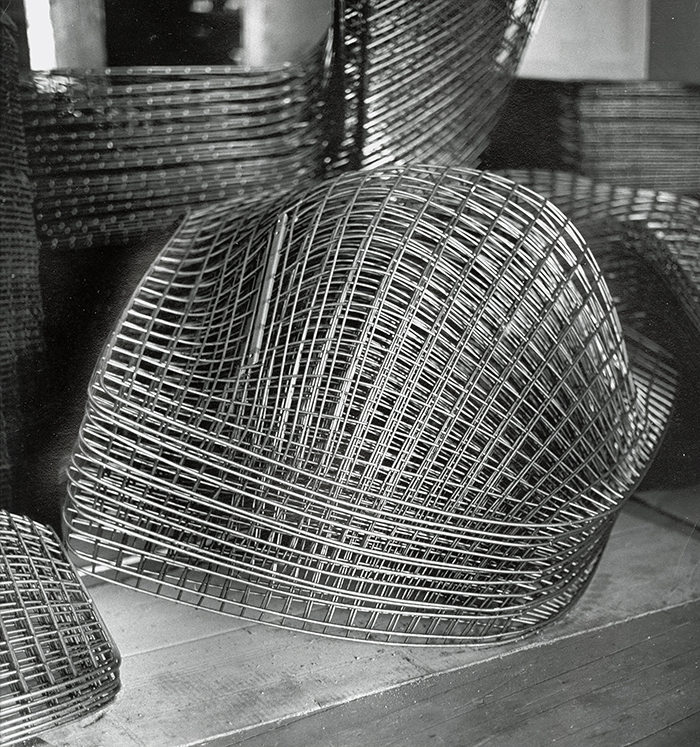 Harry Bertoia would be among the first to admit the difficulty in assembling his collection. "These chairs required a fairly complex system of manufacturing," much of which would have to be invented by Bertoia and affiliated associates in order to accommodate Knoll's 1953 production deadline. Although Bertoia’s preferred material in his sculptural endeavors was beryllium, the alloy wasn’t suited for the demands of furniture. In looking for alternatives, Bertoia initially experimented with aluminum before turning to stainless steel. “There was consideration to what metals to use, in terms of weight—steel or aluminum. The aluminum version […] proved too weak.” Still a malleable material, stainless steel enabled Bertoia to bend and give shape to the chair while, in the end, supporting a seated occupant—no heating agent is required to manually bend the rods. 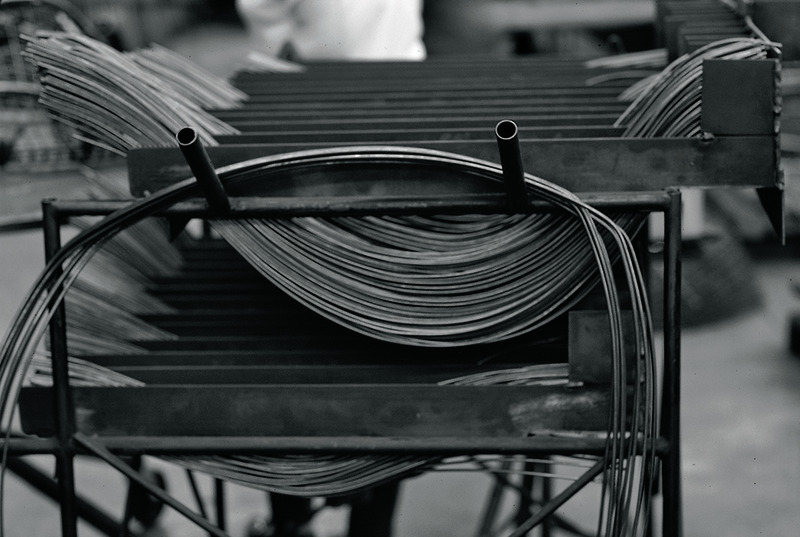 The stainless steel metal rods used in the assembly of the Bertoia Collection. Image from the Knoll Archive. 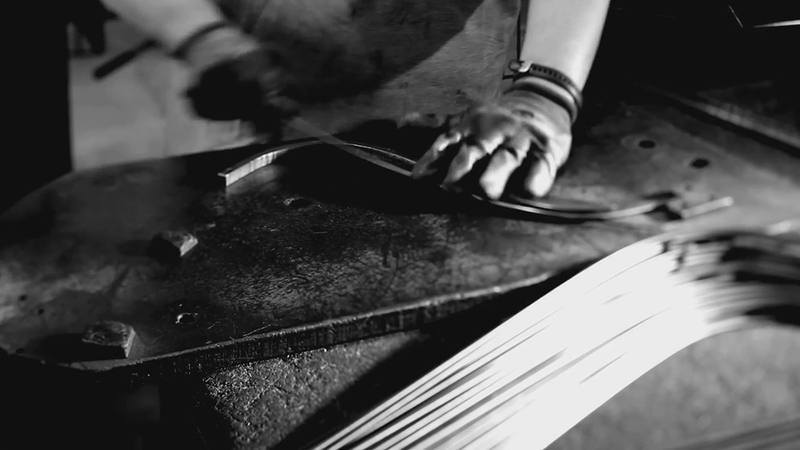 The stainless steel rods arrive prepared according to a specified width, before being cut down to pre-determined lengths. Along the chair's horizontal and vertical axis, Bertoia estimated that there were "about twenty-one or twenty two wires in the chair that could be used both ways." For Bertoia, the shape-giving nature of the process proved immensely rewarding. "I was delighted to take a wire and bend it," he asserted, "it was part of my nature." 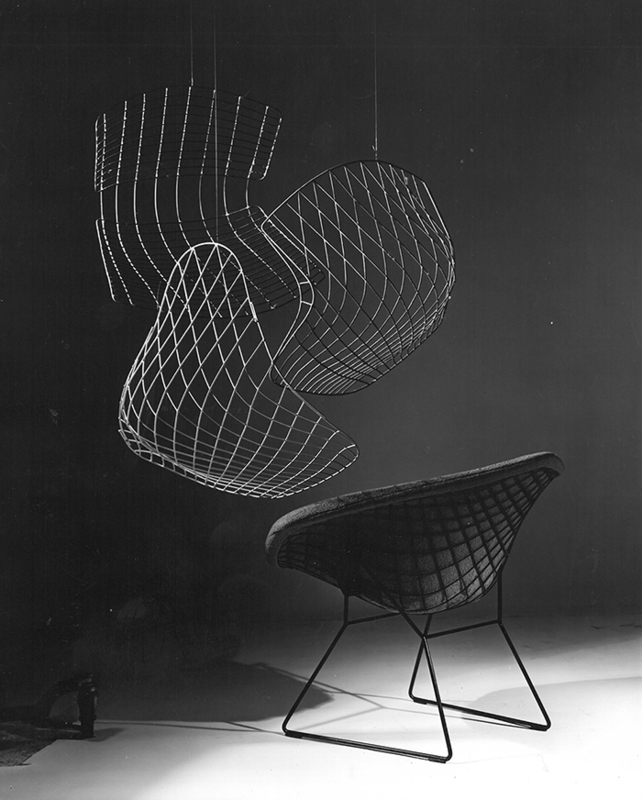 Eventually, Bertoia anticipated the process would become automated: “By curving the wires, a very primitive method was found, but the intent was to see if a machine could do it.” However, no machine could achieve the unique contours Bertoia desired, and to design a machine from scratch proved cost prohibitive for the relatively young company. “Some research was done in trying to find out if there were machines that could bend the wire,” Bertoia remembered. “They could make a straight wire and weld it or bend it sharp and weld it, but no curves.” So, today, the rods are still bent by hand, using Bertoia's self-described "primitive" method, shown below. 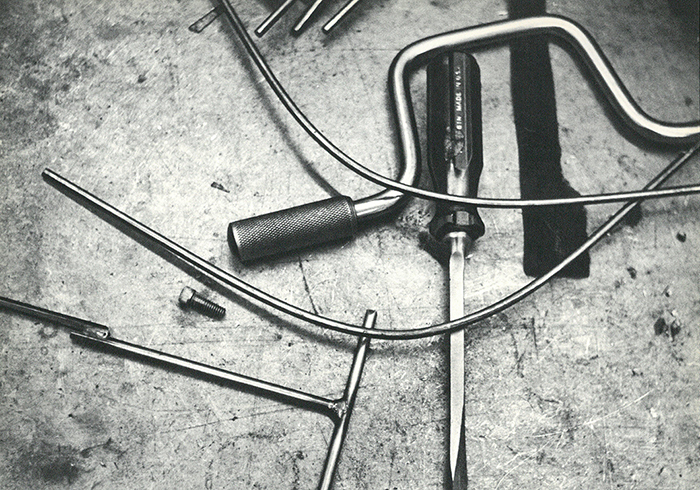 Tools used in the assembly of the Bertoia Collection. Image from the Knoll Archive. Although production is serialized and uniform, because each rod is individually shaped by hand, Adamson contends we ought to see "every one of the wires in one of these chairs" as different "from every other wire." Bending rods into symmetrical curves for assembly. Photography by Knoll. 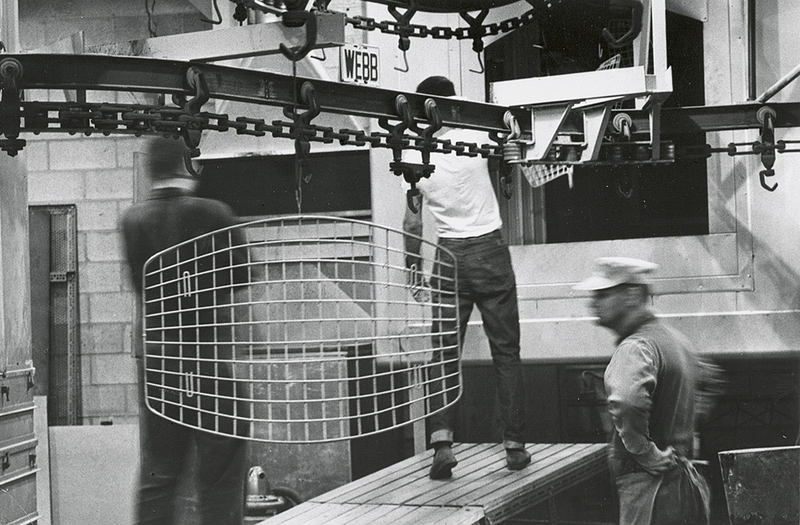 The development of the perfected, industrial-grade molds, still used today, was aided by two Knoll associates, Don Petitt and Bob Savage, who worked with Bertoia to create the infrastructure needed to manufacture the designer's collection. In this sense, Adamson contends the production of a Bertoia chair ought to be seen as “a two stage craft process: first making the tools that are going to make the chair and then actually making the chair using those tools." Accordingly, Bertoia remembers, "production began on a modest level [...] with instruments made by Savage." Workers assembling and bracing a Bertoia Diamond Chair. Photography by Knoll. The jigs used to assemble the bent rods were based on the time Bertoia spent working with Charles Eames on plywood molds used to make the DKR Chair. “This was my first real experience in furniture design,” Bertoia recalled of time. “As I look back, it followed from what material was available at that moment, which was plywood and dowels.” Subsequent improvements to Bertoia's apparatus were made by Petitt and Savage. "Don Petitt was helpful in making the jigs, [and] Bob Savage made the equipment that would bend the rim and join it." Once assembled on the jig, the chair is braced using a power drill to assure adjoining rods maintain strong points of contact. Joints being hammered together. Photography by Knoll. As the chair assumes its recognizable shape, joints are hammered using a precision tool to assure a sound structure. Excess wire being removed after the rods have been joined. Image Knoll Archive. Along the chair's outer edge, excess wire material is removed by means of an automated cutting mechanism. Edges are welded and finished with an acetylene torch. Photography by Knoll. The rim is then soldered and welded using Bertoia's favored tool: the acetylene torch. 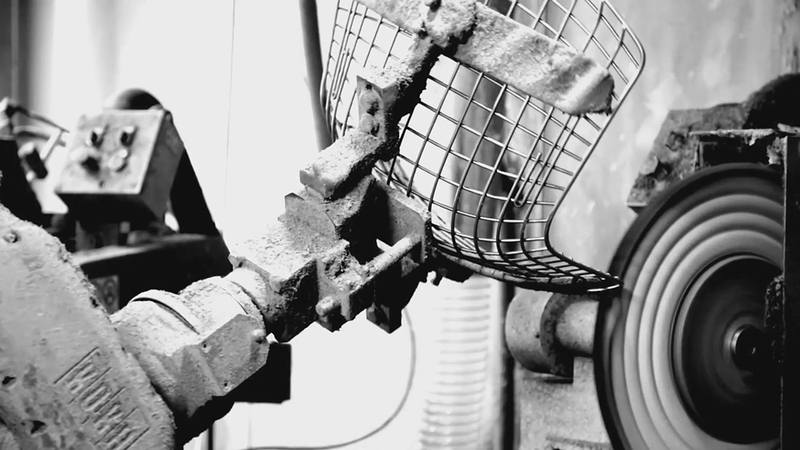 As the only true point of connection between the chair's interconnected rods, soldering assures the stability and strength of the final design. Afterwards, the edge is sanded, honed and buffed by a robotic arm to remove any imperfections that result from the soldering process. Edges buffed and honed by mechanical arm. Photography by Knoll. 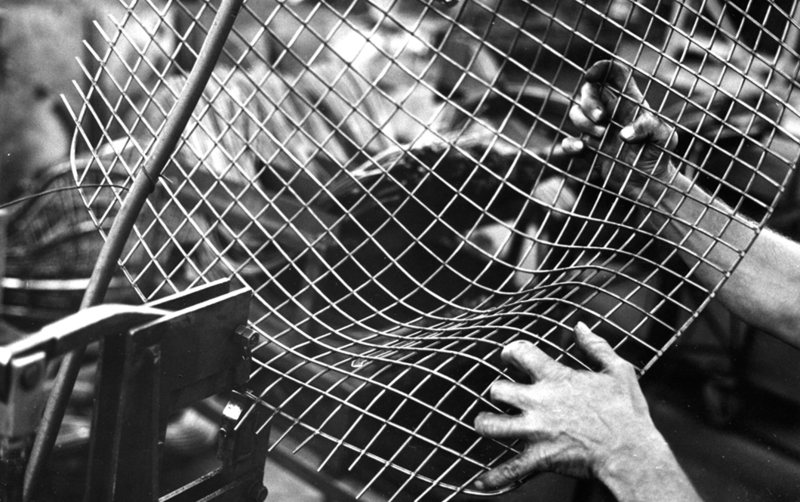 Advancements in both technology and manufacturing capabilities have enabled Knoll to invest in the machinery that Bertoia was initially forced to do without. Bertoia remembered: “I was assigned a small room and that was the beginning. There was not a single pair of pliers, a hammer, a grinding wheel, nothing.” In this respect, Adamson describes Bertoia's designs as the product of "austerity thinking." In contrast to Knoll's current manufacturing capabilities, it is important to remember that "Bertoia did not walk into a highly advanced industrial production scenario." When production has been completed, the chair's base and the top are cleaned separately using an environmentally friendly commercial cleaning solution to remove metal shavings and achieve the chair's characteristic glistening chrome-plated finish. Workers cleaning a Bertoia Bird Chair by hand. Photograph by Knoll. The chair remains disassembled during the cleaning process for ease of handling and efficiency. Now comes time for assembly. Finished Bertoia Ottoman being transported through the factory for assembly. Image from the Knoll Archive. From one process to another, completed portions of a design are transported throughout the factory along a suspended conveyor belt. Finished Bertoia Diamond Chair frames stacked and awaiting assembly. Image from the Knoll Archive. 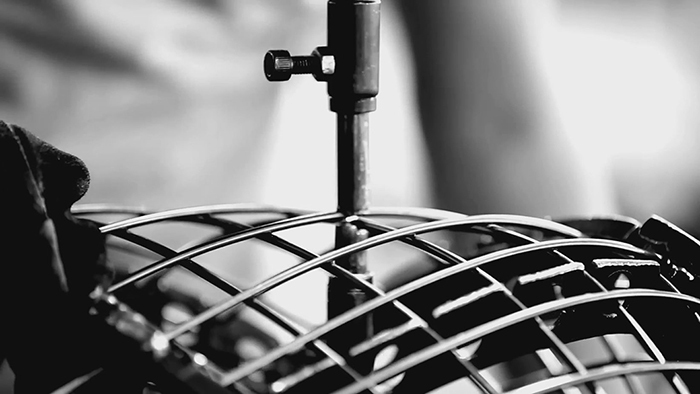 Each Bertoia chair is made to order. As a result, stacks of semi-completed baskets pile up in anticipation of forecasted order volumes. 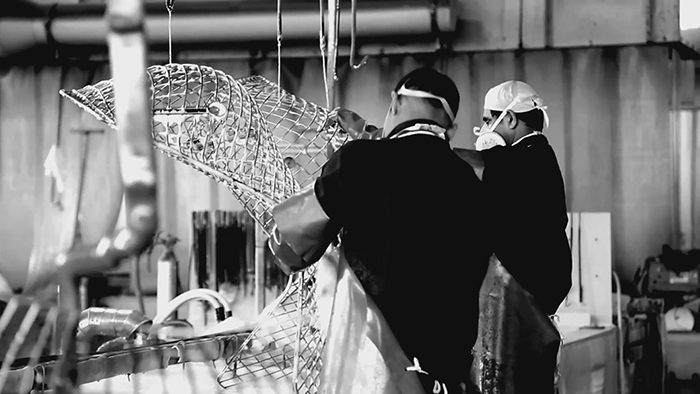 Start to finish, the production process for a Bertoia Large Diamond Chair approaches four to six weeks. For select designs, orders can be assembled and fulfilled through Quick Ship, shortening the estimated delivery window to two to three weeks. 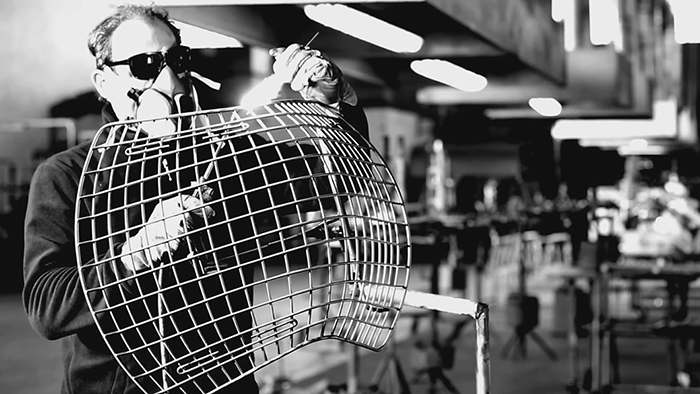 Factory worker assembling the base and frame of a Bertoia Side Chair. Image from the Knoll Archive. Bertoia designed the constituent parts of his collection to be joined together through a link-and-lock structure that resembles a paper-clip. Accordingly, assembly of the tops and bottoms requires little more than a screw driver, whereas a Bertoia Bird Chair or Bertoia Large Diamond Chair is a little more involved, on account of the chairs' shock joints. Once the chair has been assembled, it's ready for shipment around the world as a graceful addition to your living room, study or dining area. The Bertoia Collection has remained in continuous production for over sixty years, making it one of the most endurable designs of the mid-century era. Today, skilled craftsmen schooled on Bertoia's molds and methods work together to give shape to each one of the designs in the Bertoia Collection. 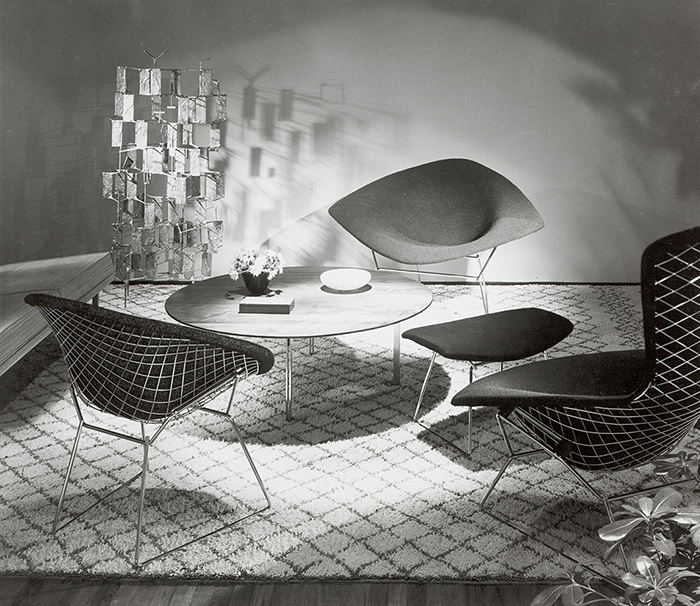 The Bertoia Collection designed by Harry Bertoia, 1952. Image from the Knoll Archive.